DALLAS, Tex. – The last thing a police supervisor wants to hear after an officer-involved shooting is “there is no camera footage,” Jason Dombkowski said at a recent demonstration of Utility Associates' BodyWorn camera gunshot detection system. As a former police chief in West Lafayette, Indiana, Dombkowski knows how failing to capture bodycam footage of use of force can be problematic for law enforcement agencies. There are many legitimate reasons why an officer might fail to activate a bodycam during a high-stress event, but in the current environment where the public expects police transparency, citizens are likely to jump to misguided conclusions that an agency has something to hide if an officer did not activate his or her bodycam. Police officers may even be reprimanded for not hitting “record,” notwithstanding that they may have been in a life-and-death situation where activating their bodycam was not an immediate concern. Utility Associates views this not as an officer problem, but a technology problem. The company believes automated recording is the solution. At the demo, the Utility team advanced its concept of “the connected officer” – an ecosystem of devices and software that leverage artificial intelligence and the internet of things to increase officer safety while preserving evidence critical for prosecution and police transparency. 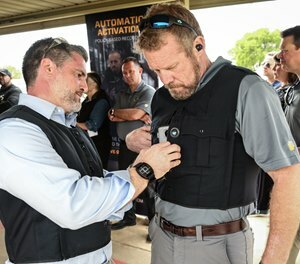 One essential tool for the connected officer is Utility’s new BodyWorn camera with gunshot detection. Easily concealed and secured in a tactical vest, the device does more than capture footage – it provides critical information that can save a life. Whenever a shot is detected – whether fired from an officer’s gun or a suspect – the bodycam automatically starts recording. The camera’s smart pre-event recording feature captures the preceding two minutes of audio and video, preserving critical information about what transpired in the moments before shots were fired. When gunshots are detected, the bodycam sends an alert to dispatch and any other officers within a designated radius. The bodycam of any officer in the alert zone will also start recording on gunshot detection. The BodyWorn camera also transmits GPS data and other critical information back to AVaiLWEB, its evidence management software that enables dispatch and command staff to view the officer’s location on a map, along with the location of the gunshot and any other officers within the alert zone. The software enables live streaming of all connected video footage in one web-based interface so tactical command can get a real-time view of the situation. In addition to increasing officer safety through improved situational awareness and alerts, BodyWorn’s gunshot detection ensures departments can access, store, secure and share the video as needed.